Ruark Consulting, LLC (www.ruark.co), based in Simsbury, CT, is an actuarial consulting firm specializing in principles-based insurance data analytics and risk management. Since 2007, Ruark’s industry- and company-level experience studies of the variable annuity and fixed indexed annuity markets have served as the industry benchmarks. Its behavioral analytics engagements range from discrete consulting projects to full-service outsourcing relationships. As a reinsurance broker, Ruark has placed and continues to administer dozens of bespoke treaties totaling over $1.5 billion of reinsurance premium and $30 billion of account value, and also offers reinsurance audit and administration services. Ruark’s consultants are frequent speakers at industry events on the topics of longevity, policyholder behavior, product guarantees, and reinsurance. Their work and commentary have appeared in numerous industry publications. Ruark Consulting enjoys an ongoing collaboration with the Goldenson Center for Actuarial Research at the University of Connecticut, and is a member of the Bermuda International Long Term Insurers and Reinsurers Association. SIMSBURY, CT , October 17, 2017 – Ruark Consulting, LLC today released the results of its fall 2017 studies of variable annuity policyholder behavior. The studies, which examine the factors driving surrender behavior, partial withdrawals, and annuitization, were based on experience from 13.8 million policyholders spanning the period January, 2008 through June, 2017. A record 25 variable annuity writers participated in the study, comprising $905 billion in account value as of June, 2017. Overall industry surrender rates in the first half of 2017 have returned upward to post-crisis levels, following a secular dip in 2016. 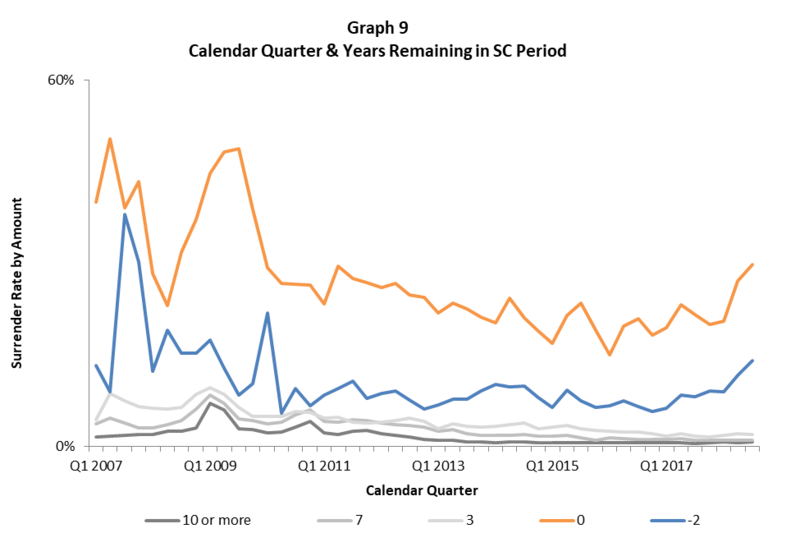 We see three regimes in the study window: Surrenders at the shock duration (the year following the end of the contractually defined surrender charge period, or CDSC) were nearly 30% at the onset of the 2008 economic crisis; shock rates below 10% were observed during 2016; and otherwise a post-crisis regime has prevailed, with shock rates in a range of 12-16% from 2009 through mid-2015 and 13% so far in 2017. The 2016 dip is only partially attributable to benefits moving more in-the-money during the year; it is likely that uncertainty surrounding the DOL’s proposed Fiduciary Rule and political factors encouraged a “wait-and-see” attitude among many policyholders and advisors. 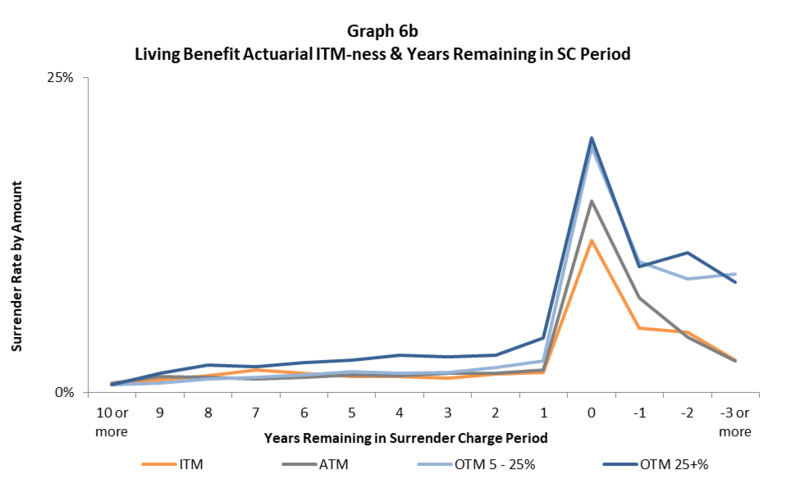 The presence of a living benefit rider has a notable effect on surrender rates; contracts with a lifetime benefit rider have much higher persistency than those with other types of guarantees. Also, a contract’s prior partial withdrawal history influences its persistency. Contracts with a lifetime benefit rider that have taken withdrawals in excess of the rider’s annual maximum have surrender rates four points higher overall than other contracts with those riders. In contrast, those who have taken withdrawals no more than the rider’s maximum have the lowest surrender rates (three points lower at the shock, for example, compared to contracts who have taken no withdrawals). 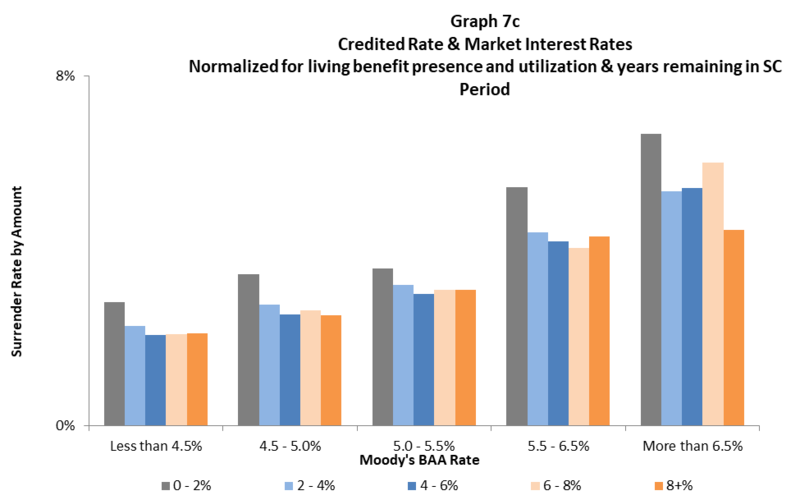 Annuitization rates on policies with guaranteed minimum income benefit (GMIB) riders are low and getting lower. The overall exercise rate for the riders with a 10-year waiting period is 2.2% by account value. Rates have been declining steadily since 2010, and quarterly observed rates have stayed at or below 2% since 2014. “Hybrid” rider forms that allow partial dollar-for-dollar withdrawals have much lower exercise rates than tradition forms, which reduce the benefit in a pro-rata fashion – less than 1% for hybrid, vs. 6% for pro-rata; the increasing share of exposure in the study from the hybrid type is a partial explanation for the decrease in annuitization rates over time. Overall living benefit annual withdrawal frequency rates have continued to increase, primarily as a result of increasing utilization efficiency. Withdrawal frequency for guaranteed lifetime withdrawal benefit riders is now over 24%, an increase of two percentage points over the past 18 months. 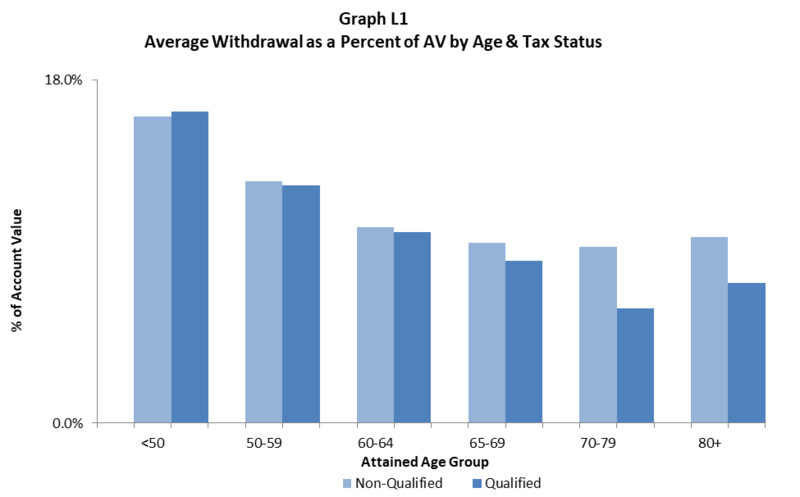 GLWB withdrawal frequencies have increased within each cohort of age and tax status, particularly at normal retirement age and above, suggesting the increase is secular. Most of the increase is attributable to more efficient utilization of the rider benefit, with over half of withdrawals now at or near the maximum benefit amount. 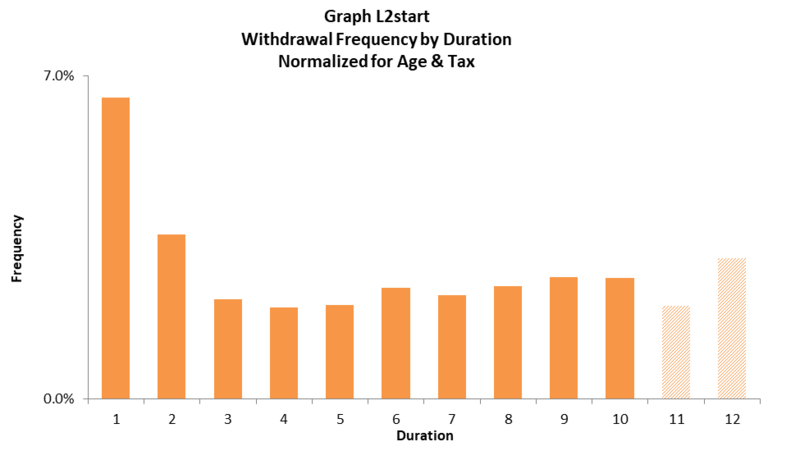 Lifetime withdrawal benefit commencement is low, 12% overall in the first duration and then falling to the 6-7% range in subsequent years. As first noted in Ruark Consulting’s spring 2017 study, exercise rates spike after year 10, indicating that benefit bonuses are effective at delaying exercise. 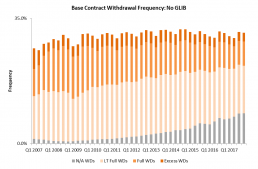 Among contracts that take a withdrawal, nearly 90% continue withdrawals in subsequent years. The effects of moneyness (account value relative to the guarantee base) on partial withdrawal behavior differ depending on circumstances. When contracts with lifetime withdrawal benefits are at- or in the money, policyholders increase the frequency of standard benefit withdrawals. This is consistent with greater benefit exercise when the benefit is more valuable. In contrast, when contracts move out of the money, withdrawals in excess of the maximum amount are more common. This is suggestive of policyholders taking investment gains out of the contract. Detailed study results, including company-level analytics, are available for purchase by participating companies. How can we translate complex and dynamic experience data into coherent assumption models? We all know why this is so important and essential for those responsible for new product pricing and competitiveness, quantification and management of inforce risks, and more predictable reserves, capital, and corporate financial performance. But how to do it is a very difficult question to answer using only traditional methods, even for us, with seriatim monthly data since 2007 covering approximately 70% of the US annuity market. Enter predictive analytics. Combining these techniques with traditional methods in a collaborative and transparent process, we develop and help clients implement coherent assumption models that are based on relevant segments of industry data and tailored to each company’s product mix and situation, and that are flexible enough to accommodate the emergence of new data. These models include partial withdrawal and income utilization behavior under GLWB and similar longevity-based guarantees, with strong goodness of fit and predictive power. And the prudent use of industry data allows us to fill credibility gaps and provide metrics that demonstrate that these models are typically better than what individual companies can do using only their own data. This is why we are here. We aim to be the platform and industry benchmark for principles-based insurance data analytics and risk management. We encourage you to consider our services as customized investments in risk management. The benefits are quantifiable in terms of actual-to-expected ratios, product pricing, hedging efficiency, reserves, and capital. Simplified pricing for variable and fixed indexed annuity experience studies of policyholder behavior, assumption models, and benchmarking. As always, our services will address the many factors of influence and their changes over time, including product and guarantee type, surrender charge period and duration, moneyness of guarantees on actuarial and nominal bases, contract size, tax status, age, gender, distribution channel and compensation structures, and income utilization and efficiency. This covers industry data and customized analysis for each client’s own data. Our industry data is more comprehensive than ever, as we have recently added several new clients totaling well over $100 billion in account value. New mortality studies for both variable annuities and fixed indexed annuities, most recently completed in 2015 and 2016, respectively. This will include analysis relative to the Ruark Mortality Table for Variable Annuities, which we know many clients have adopted for assumption purposes. As we remain committed to analytical excellence, useful delivery timing, and production speed in the services above, we aim to further automate our data gathering and scrubbing, shorten cycle times, and introduce new dashboard services that use clustering techniques to quickly benchmark and identify experience outliers for further investigation. This will not replace full-blown experience studies and related analytics, but would bring the whole endeavor much closer to real time, and improve our clients’ ability to take management actions earlier. These services will transcend product lines, and are part of our continued collaboration with the Goldenson Center for Actuarial Research at the University of Connecticut, a designated Center of Actuarial Excellence by the Society of Actuaries. Begin gathering industry experience data for other products, such as traditional fixed deferred annuities, payout annuities, life insurance, and pensions, in the US and other jurisdictions. As these reach critical mass, we plan to offer similar studies and services as above. 1st ever FIA industry mortality study. 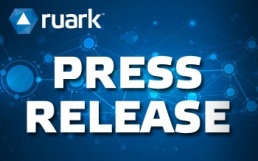 With the growth in the FIA market, particularly with GLWB features, Ruark has responded to the industry’s demand for what we believe to be the first FIA industry mortality study. FIA mortality experience is different. Similar to what we have seen in our variable annuity industry mortality studies since 2007, standard annuity mortality tables offer a poor fit to observed FIA experience, tending to understate mortality rates at both ends of the age spectrum. FIA mortality also varies widely across the companies participating in the study. FIA contracts with GLWB have approximately 20% lower mortality. This is an expected selection effect considering the longevity-based benefits provided by GLWBs. Mortality also varies by duration, tax status, and contract size. 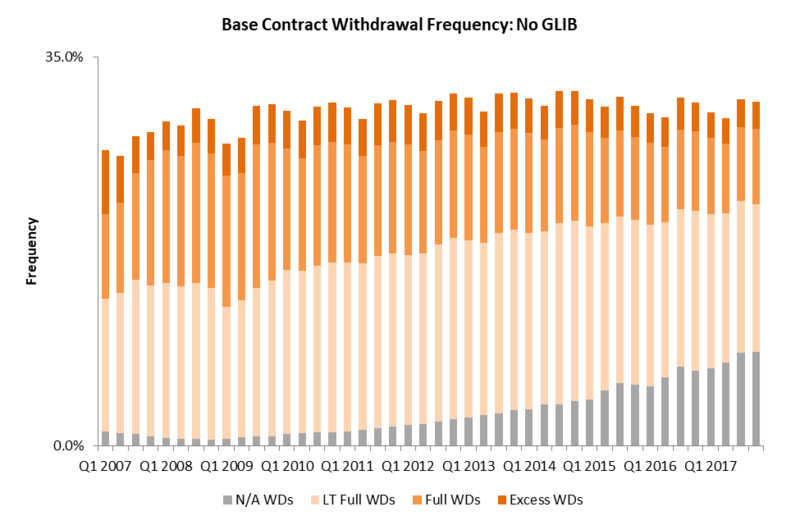 FIA mortality increases gradually by contract duration, and is significantly lower for qualified contracts with and without GLWBs. However, significantly higher mortality is evident for large contracts. Caution is warranted amidst a changing regulatory landscape. The potential implementation of the “fiduciary rule” may affect the mix of qualified and non-qualified FIA business, and agent and policyholder behavior more broadly. Prudence suggests careful monitoring of experience results and more granular assumption development. Ruark’s FIA and VA industry studies include policyholder behavior such as surrenders, income utilization, mortality, and annuitizations, which are vitally important to the long-term financial performance of these products. Through the experience study process and discussions with us, participating companies gain a detailed understanding of complex industry results and comparison to their own company results for benchmarking purposes. The 13 participating companies contributed 11 million contract years of data and 165,000 deaths for this study, covering the period January 2007 through September 2015. Ruark Consulting has completed dozens of policyholder behavior experience studies for the annuity industry and individual companies since 2007, spanning surrenders, partial withdrawals and living benefit utilization, annuitization, and mortality. We are recognized leaders in annuity risk management, policyholder behavior analytics, and reinsurance brokerage and administration.